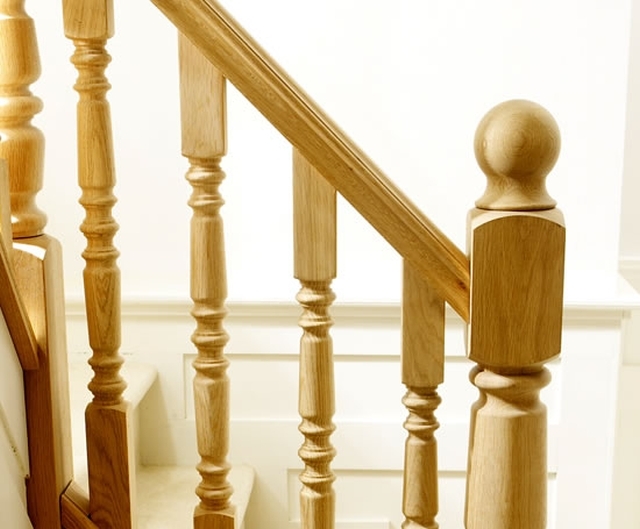 The Heritage Collection offers generously sized 115 mm newels and 55 mm spindles in a choice of classic styles, ideal for staircases in exclusive homes and upmarket developments. Supplied in white oak, the system is suitable for use in both domestic and light commercial applications, having been strength tested to withstand loadings of 0.36 kN/m and 0.74 kN/m respectively, in line with UK Building Regulations, making it ideal for a multitude of projects. White oak, unfinished – must be finished/ sealed on site following installation with a suitable finish following the manufacturer’s recommendations. WOHCA200 – Arlington, 115 x 115 x 725 mm. WOHCA201 – Arlington, 115 x 115 x 525 mm. WOHCA400 – Arlington, 115 x 115 x 825 mm. WOHCA500 – Arlington, 115 x 115 x 825 mm. WOHCB200 – Blenheim, 115 x 115 x 725 mm. WOHCB201 – Blenheim, 115 x 115 x 525 mm. WOHCB400 – Blenheim, 115 x 115 x 825 mm. WOHCB500 – Blenheim, 115 x 115 x 825 mm. WOHCD200 – Dorchester, 115 x 115 x 725 mm. WOHCD201 – Dorchester, 115 x 115 x 525 mm. WOHCD400 – Dorchester, 115 x 115 x 825 mm. WOHCD500 – Dorchester, 115 x 115 x 825 mm. WOHCE200 – Eton, 115 x 115 x 725 mm. WOHCE201 – Eton, 115 x 115 x 525 mm. WOHCE400 – Eton, 115 x 115 x 825 mm. WOHCE500 – Eton, 115 x 115 x 825 mm. WOHCF200 – Forston, 115 x 115 x 725 mm. WOHCF201 – Forston, 115 x 115 x 525 mm. WOHCF400 – Forston, 115 x 115 x 825 mm. WOHCF500 – Forston, 115 x 115 x 825 mm. WOHCG200 – Granby, 115 x 115 x 725 mm. WOHCG201 – Granby, 115 x 115 x 525 mm. WOHCG400 – Granby, 115 x 115 x 825 mm. WOHCG500 – Granby, 115 x 115 x 825 mm. WOHCH200 – Hampton, 115 x 115 x 725 mm. WOHCH201 – Hampton, 115 x 115 x 525 mm. WOHCH400 – Hampton, 115 x 115 x 825 mm. WOHCH500 – Hampton, 115 x 115 x 825 mm. WOHCJ200 – Jedburgh, 115 x 115 x 725 mm. WOHCJ201 – Jedburgh, 115 x 115 x 525 mm. WOHCJ400 – Jedburgh, 115 x 115 x 825 mm. WOHCJ500 – Jedburgh, 115 x 115 x 825 mm. WOHCA900 – Arlington, 55 x 55 x 900 mm. WOHCA1100 – Arlington, 55 x 55 x 1100 mm. WOHCB900 – Blenheim, 55 x 55 x 900 mm. WOHCB1100 – Blenheim, 55 x 55 x 1100 mm. WOHCD900 – Dorchester, 55 x 55 x 900 mm. WOHCD1100 – Dorchester, 55 x 55 x 1100 mm. WOHCF900 – Forston, 55 x 55 x 900 mm. WOHCF1100 – Forston, 55 x 55 x 1100 mm. WOHCG900 – Granby, 55 x 55 x 900 mm. WOHCG1100 – Granby, 55 x 55 x 1100 mm. WOHCH900 – Hampton, 55 x 55 x 900 mm. WOHCH1100 – Hampton, 55 x 55 x 1100 mm. WOHCK900 – Kenilworth, 55 x 55 x 900 mm. WOHCK1100 – Kenilworth, 55 x 55 x 1100 mm. WOHCL900 – Lincoln, 55 x 55 x 900 mm. WOHCL1100 – Lincoln, 55 x 55 x 1100 mm. WOHCM900 – Melborne, 55 x 55 x 900 mm. WOHCM1100 – Melborne, 55 x 55 x 1100 mm. WOHCN900 – Northbourne, 55 x 55 x 900 mm. WOHCN1100 – Northbourne, 55 x 55 x 1100 mm. WOHCR900 – Richmond, 55 x 55 x 900 mm. WOHCR1100 – Richmond, 55 x 55 x 1100 mm. WOHCS900 – Sandringham, 55 x 55 x 900 mm. WOHCS1100 – Sandringham, 55 x 55 x 1100 mm. WOHCT900 – Thornbury, 55 x 55 x 900 mm. WOHCT1100 – Thornbury, 55 x 55 x 1100 mm. WOHCW900 – Warwick, 55 x 55 x 900 mm. WOHCW1100 – Warwick, 55 x 55 x 1100 mm. 115 x 115 x 510 mm. 115 x 115 x 635 mm. 115 x 115 x 700 mm. 115 x 115 x 920 mm. 115 x 115 x 1375 mm. 115 x 115 x 2000 mm. 88 x 28 x 2400 mm. 88 x 28 x 3600 mm. 88 x 28 x 4200 mm. 92 x 55 x 2400 mm. 92 x 55 x 3600 mm. 92 x 55 x 4200 mm.